Today: The warm up. It was expected to be the warmest day, but huge bust potential as any sunshine could jump temps into the 70s. Since we were at 52F at 5am, I am conservatively going 60F-65F. Just waiting on the front just west which could slide in before evening with rain. Tomorrow: Rain ending as snow? 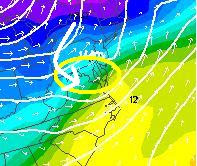 Always waiting for the next model run, but based on my morning forecast, here you can see the NGM 'slow with the low'. Based on this projection, the final wave along this old front will be to our southwest on Thursday evening. Cold air will spill in, but not allow the freezing line to catch up and for us to turn over to end as snow. 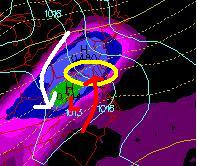 Here however is the NAM model for the same time. You can see the low has passed to our south 'east'. That would allow the north wind to drag down colder air. There is one problem here. Notice the yellow line- that is the famed '540 line'. 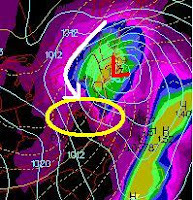 A thickness measured that often relates to the rain/snow line in storms. It is too far north, but not the only ingredient. There is a lot of information to decipher, but here is the 850mb Temperature map. 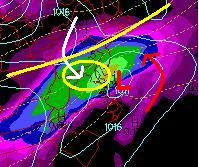 This is an idea of where the freezing line might set up at cloud level (roughly 4,000Ft). What's difficult here is that surface temps may be above freezing while it's cold enough aloft. I see this an an elevation thing at best. Which means Hereford Zone and up near the PA line has the best chance, but lower elevations will not allow any clouds flakes to survive the trip. Locally, just a near miss for most of us. I would not want to be in your shoes Justin. Good Luck.